Lock in a great price for Skerzzo Guesthouse – rated 8.2 by recent guests! This is a funny hotel in a funny sort-of-historical, renovated building with a funny floor plan. I liked it. The room was well-equipped (a kitchenette with a fridge and a microwave, air conditioner, TV), the location was convenient (between the central bus station and the tourist center), and the overall value for its low price was very good. Stuff was very nice. It is centraly located. Good value for money. The location was excellent . free parking large spacious room.nice to have a bath. Wonderful breakfast, excellent Expresso coffee. Perfect downtown location. The host was nice. We came early to the hotel (around 10 am) and the host kept our belongings safe while we were on a tour. She also made our room ready in less than an hour. It was very nice of her. Everyone was very friendly and accommodating. The room was very nice and well furnished for the price. Also, the location was perfect, as almost everything of interest in Plovdiv is only a short walk away! Friendly owners, late accomodation possible, the studio was very big with modern facilities. Skerzzo Guesthouse This rating is a reflection of how the property compares to the industry standard when it comes to price, facilities and services available. It's based on a self-evaluation by the property. Use this rating to help choose your stay! One of our best sellers in Plovdiv! Featuring free WiFi throughout the property and free parking, Skerzzo Guest house is an architectural monument in Plovdiv. It was home of a famous merchant Freeman family and after that it was a music school. Every room is equipped with a flat-screen TV. Certain units include a seating area for your convenience. You will find a kettle in the room. Each room is equipped with a private bathroom fitted with a bidet. The guest house also offers car hire. 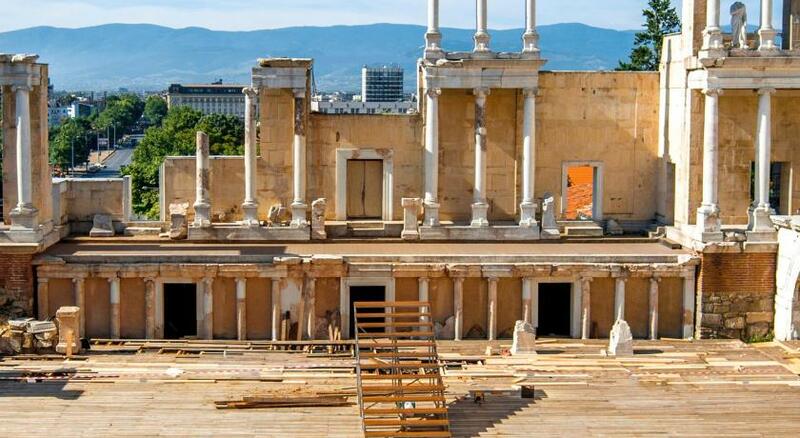 The center of Plovdiv is 1,000 feet away from Skerzzo Guest house, while the Singing Fountains and the Garden of Czar Simeon are at around 1,300 feet. Plovdiv Airport is at 8.7 mi. 뀐 Located in the real heart of Plovdiv, this property has an excellent location score of 9.3! When would you like to stay at Skerzzo Guesthouse? This double room has a microwave, seating area and mini-bar. This double room features a mini-bar, kitchenette and kitchenware. This studio has a mini-bar, electric kettle and kitchenware. This apartment features a kitchenware, electric kettle and flat-screen TV. This triple room features a seating area, mini-bar and cable TV. This studio features air conditioning, seating area and kitchenette. House Rules Skerzzo Guesthouse takes special requests – add in the next step! Skerzzo Guesthouse accepts these cards and reserves the right to temporarily hold an amount prior to arrival. There was no hot water and the bathroom was not the one in the photos. There was an awful smell of sewage and mold all over the room while we also found a cockroach, flies and a spider near our bed. Walls were not clean as well as the white footstool under TV. The strom was not at all comfortable and the bed's back side was ready to be detached. Furthermore, each time we were sitting on the bed it was squeaking and shaking. There was no air-condition in the room and the portable machine they had for heat wasn' t working. The lady in the reception had difficulty in speaking english and she wasn' t always in the reception desk. When we reached the guesthouse for the check in we needed about 10 minutes to found a way to get in. (However during our check out she gave us her viber number in order to contact her open the door and collect our stuff - that was really nice of her.) Lastly, she asked us check out at 11am while in the room's leaflet it was written down 11.30 am and on booking.com 12am. The location and the fact they let us leave our luggage in a safe place before check in and after check out. Far, far too overly fragranced. Has those air freshener “squirty things” that you usually find in toilets in the common areas. Too much artificial/chemical floral for me - gave me a headache! Friendly and helpful welcome and a great place to spend a night or two for exploring the city. Has own private parking which is just brilliant if you are arriving by car. Good value for money if you just want somewhere to shower & sleep. The staff was very nice, location is perfect and there is a parking. The place looks a bit outdated. Small changes in the room might make a big difference. Location. It's close enough to walk to city centre, the area is pretty quiet and it's quite easy to park. Private parking is also available just beside the Guesthouse. There was a problem in the kitchen during my stay, so I couldn't try their breakfast. However, there are many places around where you can have a proper breakfast. Room was warm and comfortable, with a reasonable size. The friendly atmosphere, the privacy, the location. One tiny point... If walking from the train station you may come across a notice giving directions to the reception. The notice is open to misinterpretation. Reception is at the restaurant entrance at street level around the corner. I stayed in December and the room had an efficent heater. Good location. I stayed in their suit, loads of room and balcony. Clean and quiet. Good communication. Quiet neighbourhood, but just a few minutes walk to shops and bars. Good selection breakfast from a menu, value. If Booking calls is 3 Stars hotel and give it score 9.0 it makes me dougbt Booking very much from now and on. This is an insulting place and should be shame to call it hotel. Guys just do not go there. you have been warned!!! The room was underground with one window which was high and without a view. Water was running out of the shower and the whole bathroom floor was wet after taking a shower. Furniture was low quality. Staff was friendly. Price is ok. Location is good (close to the singing fountain) and not far from the old town either. WiFi was working fine. Private parking is available. There is a good restaurant just a couple of minutes walk from there.